We hear about volcanic eruptions in Hawaii and marvel at the fiery red molten lava that threatens to destroy homes and property. But the fact is that eruptions have been continuous for more than 35 years in Hawaii Volcanoes National Park on the Big Island. The thought is hard to comprehend until we start a tour from the dry, rocky side of the island to the more tropical and humid coast. We meet few cars on Saddle Road (Hwy 200), a deserted span that cuts across the middle of island instead of following the coastline. Brown tufts of fountain grass pop up along the road with a few mesquite trees scattered around. The ground is covered with remnants of past volcanic activity.This is mostly ranch land with tradewinds blowing across the island that shake our van. to the wetter, tropical side of the island. 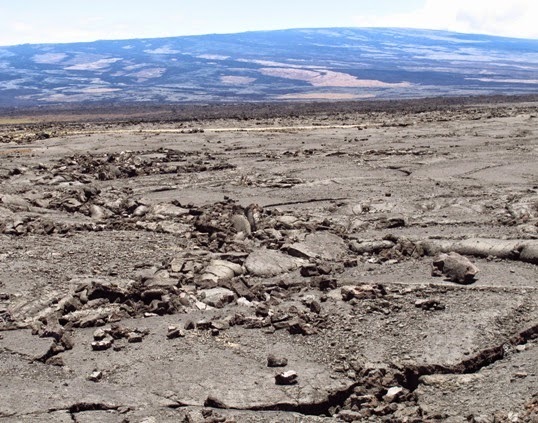 The entire Hawaiian Island chain was created by volcanoes, which still fill the ocean for 18,000 feet below the surface. When there’s a hole in the earth’s crust, heat comes up from the mantle causing lava to dribble out rather than blasting the top off. 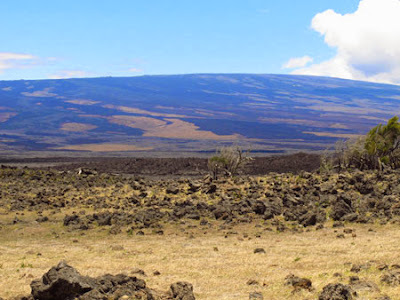 The entire Big Island is a hot spot with a constant flow of lava in what is now the protected park. As the youngest island in the chain, Hawaii is made up of five volcanoes that are constantly changing. 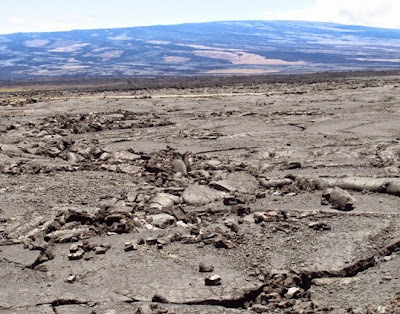 Mauna Loa, an active volcano that last erupted in 1984, is the largest mountain in the world by volume. Even though only the tip is visible above water, it makes up 60 percent of the island. Leaving Thurston Lava Tube, a massive lava cave. As we enter the national park our guide explains that we’re going back to the birthplace of the islands. 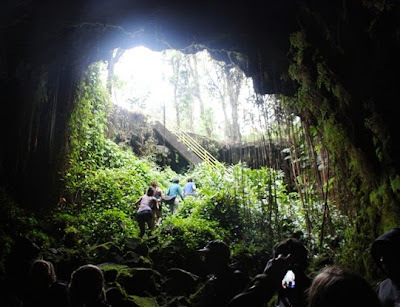 Our first stop is a lava tube, a cave-like structure that we can walk inside. In its natural state with rocks, dripping water, and slippery algae, we’re give flashlights to maneuver through the dark. 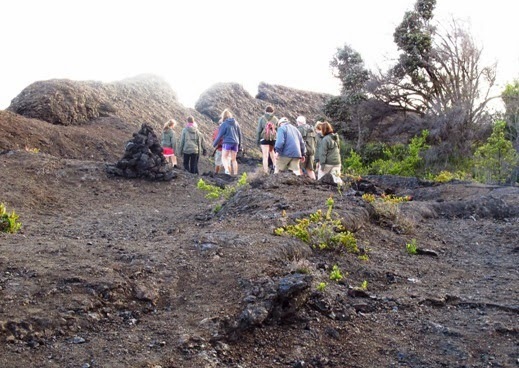 Our guide explains that there are two types of lava—a smoother, spongy variety and craggy volcanic rock that is as sharp as a Brillo pad. At Huaka Crater we hike a bit off the beaten path and experience this type of lava—it sounds like walking on glass and can cut if you happen to fall on it. This deep crater contains rocks as large as automobiles at the bottom that were offered as gifts to Pele, volcano goddess to whom Hawaiians believe they owe the very existence of their island. 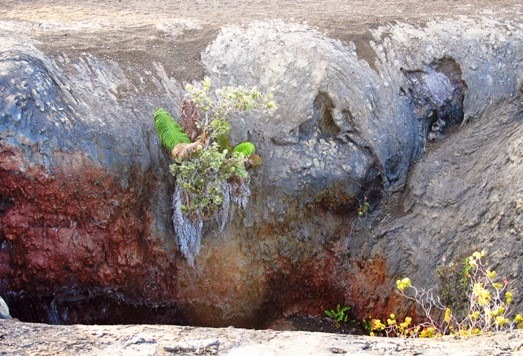 We see a curiosity, a lava tree: Lava from the 1979 flow surrounded the trunk causing the tree to die but leaving a perfect, empty mold. I’ll describe more scenes from the park in a future article.